Looking for an EHR that can grow and adapt with you as your agency grows? We serve agencies large and small; some of our clients have only 2 FTEs, while others have scores of FTEs and serve populations of hundreds of thousands. Nightingale Notes EHR is easy to use, quick to implement, scalable, flexible, reliable, and secure no matter your agency size. 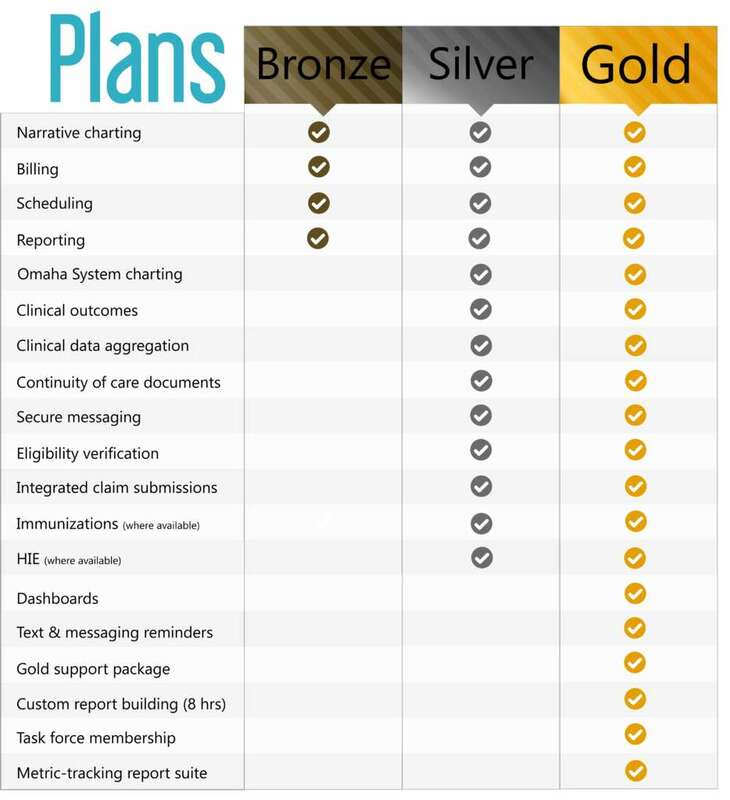 Our Gold level package is for agencies who require a robust and powerful EHR. All of the capabilities of our Silver package are included and, in addition, you’ll have access to features like dashboards, automated reminders, custom report building, and an opportunity to help us determine how to prioritize the top features our clients have requested. Most of our clients gravitate towards our Silver package. The Silver package is robust and meets the needs of most agencies, while still providing powerful features and integrations. Outcome-based reporting is made possible because Omaha System charting is built into the core of the EHR, and every piece of data put in can be pulled out in a report in a meaningful way. You’ll also have access to our integrations with partner softwares as well as immunization and HIE integration depending on your state. Our Bronze package is most often chosen by agencies who are very new to the world of EHRs and want to make the leap from paper charting. Many times these agencies start out with the Bronze package to get their feet wet, then upgrade to the Silver package later. You’ll still have access to an extensive network of peers, our highly experienced trainers, and our many free and ongoing training and networking events. Contact Us today at (507)-388-4141 to discuss your agency’s needs and let us help you determine which package will serve you best!